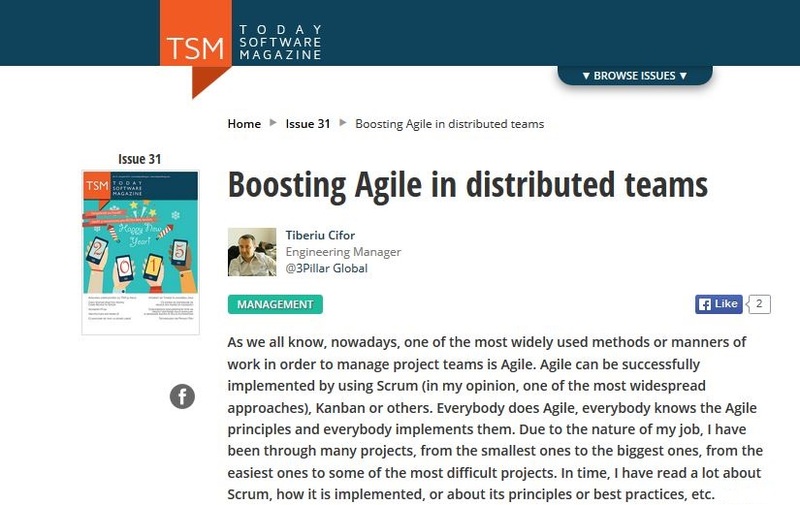 Recently, Tiberiu Cifor, Engineering Manager at 3Pillar, put pen to paper and tackled the subject of Boosting Agile in Distributed Teams for Issue #31 of Today Software Magazine in Romania. The article makes for an interesting read, especially in today’s time when Agile has become the go-to methodology for software product development. In this article, Tibi highlights some of the advantages and disadvantages of distributed teams. He writes about how the different time zones of the team members must not be perceived as a disadvantage, the importance of taking clients into confidence on distributed teams, the need to clearly demarcate roles and responsibilities of the team members, and how crucial it is for efficient communication to happen between a team. Tibi also explains three levels of active listening that can bolster communication process between teams. Want to know what these levels are? Read the full article on the Today Software Magazine website.